QTY 1234567891011121314151617181920212223242526272829303132 Please select a quantity. These are the scarves everyone is raving about!!! Add this warm hued blanket scarf to any outfit to complete the perfect fall look! Super versatile so there are endless ways to wear it! Fringed at the ends to add style. It’s made of super soft material that will warm you up without being too bulky. 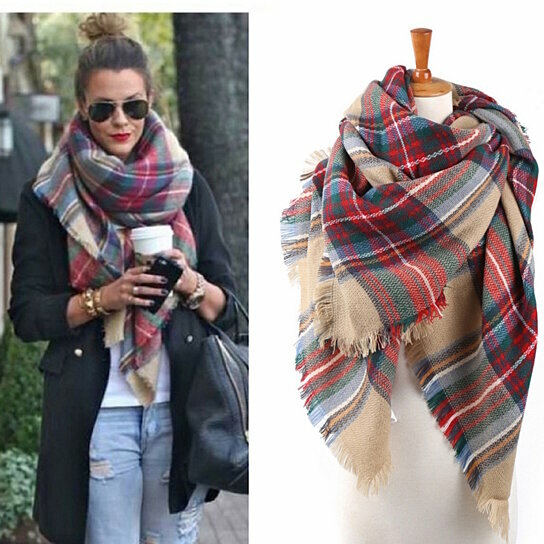 * Soft and warm, over-sized plaid blanket shawl wrap scarf poncho. * Easy to wear and pair with jeans, leggings, dresses. Fashionable and stylish. * New trending fashion statement of the fall and winter season. * Approx. 56"x56" and 100% soft acrylic.